Attracting droves of travellers interested in Ancient Egypt and archaeological treasures, Cairo, at first glance, may not seem like the best place to travel with children. After all, it's hot, dry, crowded and full of ancient temples and structures that children may find hard to relate to. However, Cairo does have a little something to offer its younger visitors. Obvious attractions such as the Great Pyramids of Giza and the Sphinx will amaze visitors of all ages. Riding a camel or Arabian horse round these spectacular attractions is a fantastic activity for the whole family and a good way to keep the kids interested. Older children might enjoy the Egyptian Museum of Antiquities, but a great way to teach the younger ones about Ancient Egypt is to take a barge ride through The Pharaonic Village where they can enjoy history being acted out. 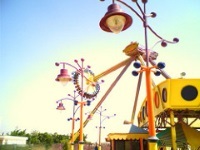 There are plenty of amusement parks in Egypt to enjoy too, such as Dream Park or Sindbad where children can enjoy plenty of rides and activities. For days when the heat is scorching and going outdoors with the children is not an option, take the kids to an indoor playground or amusement park, such as Magic Galaxy, which offers something for children of all ages and even a baby zone for the youngest visitors.